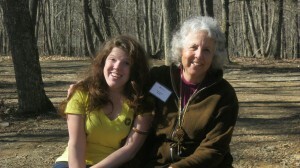 UNCG Biology professor Ann Somers talks with former student Chandler Hagan about the future of the natural world. AS: What are your hopes about the human relationship with the natural world? CH: I can’t see why there’s so many people that want to deny that we are, you know, a part of this greater thing and that we should protect it and love it because it comes so naturally to me and it comes naturally to a lot of people, I think. I think we almost have to be trained not to think that way: to disregard other life, to disregard, you know, ruining these landscapes. You know, mountaintop removal, people just accept it. They just accept that we’re going to just clear-cut land and say goodbye to those and destroy, you know, the world for really nothing. So, I mean, my hope is that we can just get back to that understanding that we’re part of the world. And people just think, “Well if you’re not for technology and advancement, you’re against it,” you know, and, “We’re all going to be living in caves and wearing buckskin and, you know, deerskin.” No, we are these advanced human beings. We can understand our relationships, and we can find a way to live, like, in peace that should show the highest form of human advancement—that we can accomplish what we want to accomplish as people but still not harm the rest of the world. And that’s my hope. Right now, people won’t even recognize that as a goal. They won’t even say that that’s possible. They say, “It’s either this way or no way.” And I just want people to say, “It is a possibility that we can live in harmony with the rest of the world, that not everyone needs to suffer just so we can get ahead.” And if they could just acknowledge that, then I think we could make huge progress quite quickly. AS: Well, I’d like to tell you about one of my hopes. And that is that there are more and more people that come along that are able to, that their parents do let them explore unsupervised and that breed and come to the kind of understandings that you’ve come to. And so my hope for the world is that we see more people like you.